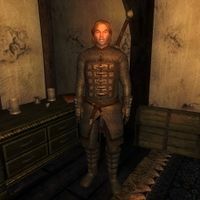 Keld of the Isles is a Nord blademaster and a Guardian of the Fighters Guild in Cheydinhal. The leader of the guildhall, Burz gro-Khash, characterizes both him and fellow guildmember Ohtimbar as “useless”, but Keld of the Isles can't be bothered and still tries hard to fit in. He sleeps on the second floor every night between midnight and 6am, and will, after waking up, spend the first six hours of the day wandering around near his bed. At 12pm, he exits the building and heads to Borba's Goods and Stores and hangs out there for two hours. At 2pm he pays a quick visit to the guildhall basement, before heading to Newlands Lodge for lunch. At 4pm, he returns to the guildhall and wanders around there until he sits down for a two-hour dinner at 6pm. At 8pm, he goes down into the basement to practice his blade skills on the training dummy. He stops at 11pm and spends the last hour of the day strolling around the ground floor until his bedtime at midnight. He wields a steel claymore and wears an almost complete set of chainmail armor: boots, cuirass, gauntlets and greaves. He only carries a small amount of gold. When you meet him for the first time, he will introduce both himself and his philosophies: "Keld of the Isles. Guardian of the Fighters Guild. And how did I achieve that high rank, you ask? Patience. Caution. Slow and steady wins the race, my father always said. Careless fighters get one last white shirt and a box. Not me." When asked about his city of choice, he will reckon that their guild leader can be hard to work with: "I've settled down here. Nice place. A little slow, but it suits me. Burz gro-Khash is a bear sometimes, but I got thick skin. Doesn't bother me." Burz gro-Khash obviously is not too impressed with Keld's Guardian rank in the guild, as he will remark, "This guild is going to hell in a hogcart. Look at what they give me? Keld of the Isles? Ohtimbar? Both Guardian rank? Phah! Useless." Keld's brief trip down to the basement is an abortive attempt to start sparring practice. He is supposed to spend four hours sparring with melee weapons but his AI package is set up as a "Find" instead of "Use Item". If the package were correct, it would instead override his trip to Newlands Lodge - a case of one bug preventing another bug happening. Esta página foi modificada pela última vez à(s) 07h04min de 20 de março de 2014.